Sales reps are extremely busy people. If you don’t have any free time, how can you get a quick overview into how you’re performing and how healthy your pipeline is? Our resident sales experts all use dashboards as part of their sales process. We share why dashboards play such an important role in helping them reach their targets. From sales forecasting, pipeline analysis and comparison reports, we list the top 5 sales dashboards we use to boost revenue. Salespeople are swamped with tasks: attending sales meetings, cold calling, social selling, preparing presentations, and closing deals. Dashboards will tell you when you have to increase the number of new sales opportunities or when you need to focus on closing more deals to reach your budget. To take visualization a step further, you can even customize your dashboards into different colors as you reach or surpass your sales targets! When you drive on the highway, you are able to check how fast you are going by checking your car’s dashboard. With one look you know if you are within or above the speed limit. Well, you can do exactly the same in SuperOffice CRM! This way you can make sure you fill up your pipeline again. Otherwise, you might run the risk of not reaching your target in the next few months. Working as a sales rep is one of the most competitive jobs there is. Not only do you try to beat your competitors, but you also need to outperform your colleagues. Most importantly – you are always competing against yourself. 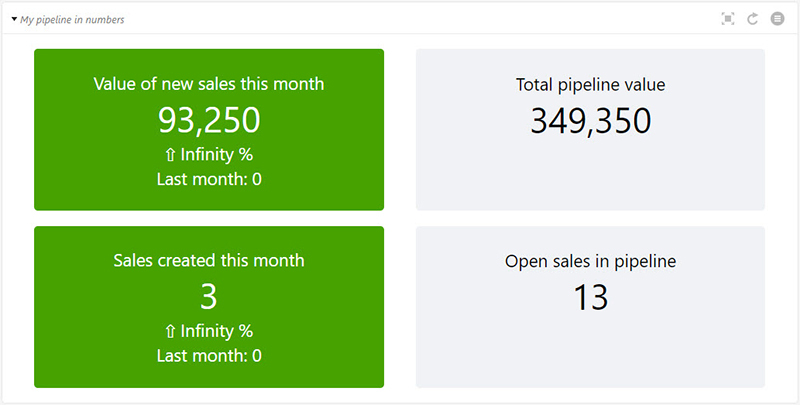 The year to date (YTD) comparison dashboard will help you keep track of your progress month after month. This dashboard allows you to see how well you are performing against your sales Key Performance Indicators (KPI’s). If you can keep the yellow line (this year’s sales numbers) above the blue line (last year’s sales numbers) as often as you can, then you are sure to be among the top sellers in your team this year. As a sales rep, you will often find yourself “out and about” in the field. With Pocket CRM, the SuperOffice mobile CRM app, you can check the status of your pipeline or your current activity level directly on your mobile device, anywhere and at anytime. This way you will be able to stay in control of your sales 24/7. 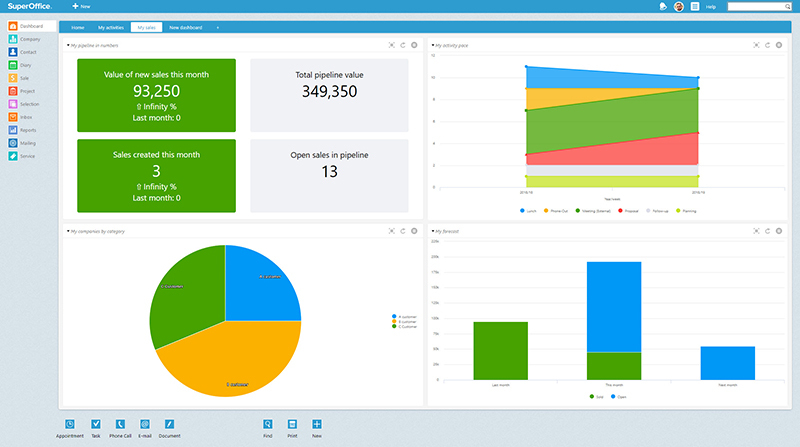 By using these 5 dashboards, or any of the dashboards your CRM software has to offer, you won’t have to spend time on creating forecasts or reporting. 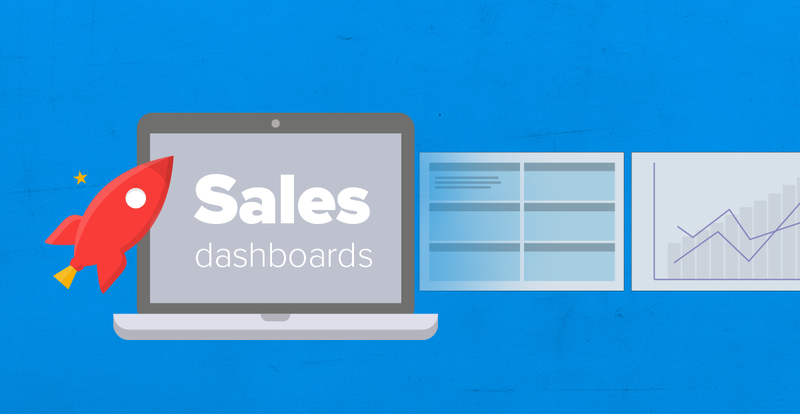 How do you use sales dashboards in your company? P.S. All of the dashboards mentioned in this article can be found in SuperOffice Sales. To learn more about how to use these dashboards, please request a personalized demo. This is a great list of sales dashboards. I'll use them to help improve my own sales performance. Thank you!